Every once in awhile I come across a book that is hard to review. It's unique, it's necessary, and it really does take reading the book to discover how special it really is. As far as I'm concerned, Every Little Thing by Deidra Riggs is something special. It's also hard to describe as a book. Some sections don't read like a book at all, they feel more like Mrs. Deidra Riggs has popped over and you've found yourself in the middle of a good conversation. Other sections are meant to be shared, read over and read aloud to get the full impact (something my husband will confirm though it may come with some mutterings about reading in bed at 11:30 pm, oops) Still other sections brought me back to my college days with the depth of the subjects Deidra dove into while still maintaining a beautiful simplicity this tired Mama could grasp at midnight. The book opens with a quote about finding the extraordinary how it's here, how it's hidden in plain sight in the ordinary. 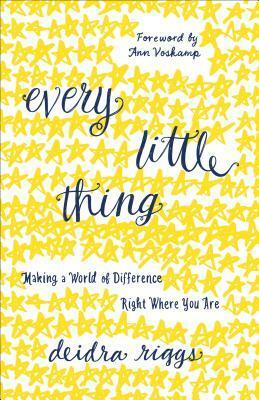 Over the course of 9 chapters Riggs takes her readers through the ordinary, pointing out the pitfalls that can hinder us and the truths that can lift us into that extraordinary in the every day. As a flipped through the pages (especially in sections 1 and 2 as the book is split into 3 sections) it was like having a conversation with Riggs. I'd sit and go "yes, that's nice but" and the next page would dive right into my unasked questions. Riggs honesty was refreshing and her humour delightful. Having started to come through the other side I alternated with giggles and knowing nods during her recounting of the first seven years in Nebraska (a definite highlight). This book is timely and because of that, some people are not going to like it. For some, the combination of Riggs' honesty and the subject matter will be too painful. For others this book will be the breath of fresh air they've been looking for. Personally, I'm wondering how hard it would be to turn this into a book study. It's that good! Riggs writes from what she knows and that's part of the books appeal, her topics are the questions I hear over and over again: what to do with the lies, when we miss the mark, when we don't want to go, are we hearing right. This is a book about life in all its moments. Disclosure of Material Connection: I received this book free from the publisher through the Nuts About Books book review bloggers program. I was not required to write a positive review. The opinions I have expressed are my own.